Highly praised tale of crime and punishment, friendship and betrayal. When Stanley Yelnats is sentenced to dig holes at Camp Green Lake, his quest to discover what he is digging for leads to danger, adventure and a confrontation with his family's past. Stanley Yelnats' sentence is to dig hole after hole in the burning desert at a juvenile detention centre like no other. As his story unfolds, so does that of his ancestors. Will Stanley be able to dig up the truth before he falls victim to the family curse? The novel is rich in descriptive detail, and tackles such important issues as crime and punishment, family and literacy. There are many opportunities for study of character, themes and subplot, and an examination of the book in conjunction with the film would provide a number of multimedia opportunities. Winner of the 1999 Newbery Medal, Holes is a truly remarkable novel that has captured the imagination of a generation of readers. Louis Sachar was born in New York and has published many successful children's books in the USA. 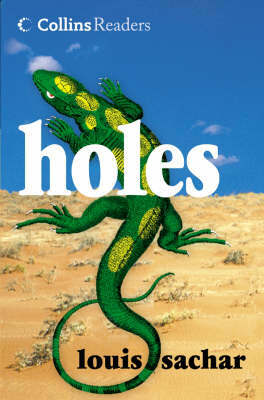 Holes was the first of his novels to be published in the UK with tremendous success, both in schools and at home. There's a Boy in the Girl's Bathroom is the second of his novels to be published in Britain.